Profile: Perceptor loves spending time on Earth with his human friends, particularly the young Kicker. Having spent years with Rad, Carlos and Alexis, Perceptor feels a special bond to them and their planet. He loves the culture of Earth. Humans are all similar, yet so diverse at the same time, much like his own personality. Now that the Mini-Cons are no longer hunted for their power, Perceptor is free to spend his time on Earth with his human friends. He seamlessly combines the qualities of the three Mini-Cons from the Street Action Team; Grindor, High Wire and Sureshock. >From Grindor, he inherits creativity and a positive outlook. High Wire's motivation keeps him focused on the task at hand, and teamwork mentality enables Perceptor to integrate the three personalities instead of becoming confused. From Sureshock, he acquires intelligence and the ability to make wise inferences. He helps others improve themselves much the way an Earth psychologist would, with reason and understanding. He helps Autobots battle shortcomings and helps Mini-Cons to see a unified goal of freedom. Anything that Perceptor does, he does with a purity of purpose that is lacking in most creatures. He doesn't fight for the sake of fighting, he fights to rid the universe of oppression. He doesn't talk just to talk, he helps others work through their problems. Although small in stature and peaceful in persona, Perceptor is a skilled warrior. 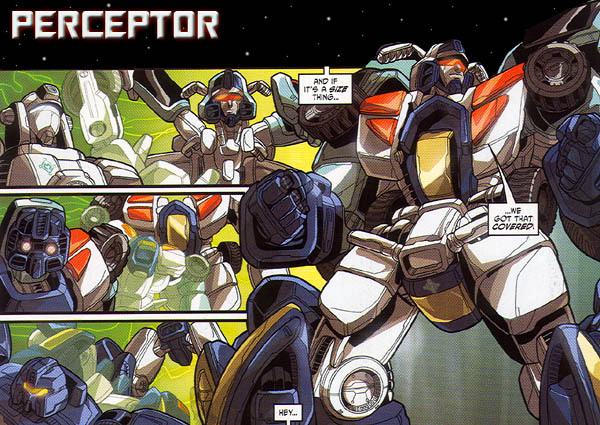 When the members of the Street Action Team wanted newer and faster forms, Perceptor gained a new form as well. Abilities: Containing three Mini-Cons, Perceptor is very strong for his size. He has been known to take down Decepticons twice his size with relative ease. He is an expert at using uncommon means to defeat opponents in battle. He possesses mysterious mental abilities, including the ability to communicate with Mini-Cons on a telepathic level. Weaknesses: Perceptor's only real weakness is when he is separated into the three Mini-Cons. Also, fondness of Earth and humans would be considered a weakness by the Decepticons. *Armada episode #4: Comrade - Attempts to rescue Optimus Prime from Megatron and Starscream. *Energon episode #3: Scorponok - Shown as friend of Kicker. *Energon comic #27 - Joins Autobots headed to Earth to stop Terrorcon attack. *Energon comic #28-29 - Defends Los Angeles against Insecticon clone attack.